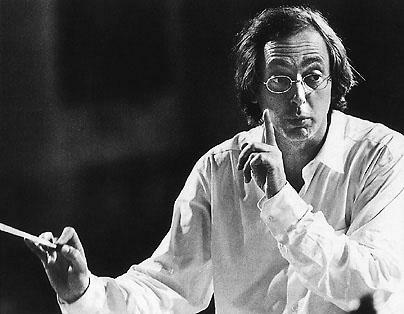 Fifty-year old Flemish conductor Philippe Herreweghe is a founding father of the baroque authentic practice, original instrument movement and one of harmonia mundi's most prolific recording artists, with over sixty albums to his name. His early training as a chorister and assistant choirmaster in a Jesuit school was complemented by piano studies at the Ghent Conservatory. At university Herreweghe studied psychiatry and formed a 12-person choir devoted to the revolutionary performing practices of Gustav Leonhardt, Ton Koopman and the Kuijken brothers. 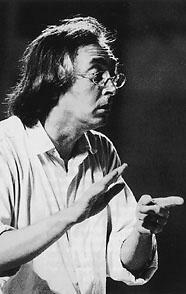 In 1970 Herreweghe gave up medicine, and his choir took the professional name it bears to the present day, Collegium Vocale. I spoke with Maestro Herreweghe in October at New York's Metropolitan Museum of Art before a performance of Mahler's Das Lied von der Erde with the St. Luke's Chamber Ensemble. As we sat down in the green room, a stagehand brought Herreweghe a soda and the Maestro praised New Yorkers for their friendliness. "So different from Paris", he added with a naughty smile. SM: Do you come to the United States often ? -I've been here a couple of times with the Orchestra of St. Luke's and with my European groups, but touring in America is financially very difficult, which is a pity because I love the country. SM: Have you ever performed in Canada? -Once, long ago. However, in a few days we are taking the Mahler to Toronto ... Toronto is in Canada, isn't it? SM: What is the Herreweghe philosophy on original instruments and authentic performance? - The big debate today over authentic performance of nineteenth-century music such as Beethoven and Schumann on period instruments is exactly the same as it was twenty years ago about baroque music. Some of the same critics are even using the same objections they used back then. At the beginning of the baroque movement we defended the position that baroque music, for example a Bach cantata, should be given a chance to be musically convincing in its original form and on its own merits. First of all, that means respecting each instrument's fundamental character, le sens même de l'instrument. One of the problems we encountered was the disappearance of boys' choirs such as Gustav Leonhardt and I used for the Bach cantatas on Telefunken. In the old days no one had cars, so boys went to church on Sunday and learned to sing. Today families spend the weekend at the beach and there are no more boys' choirs, so we have to use a mixed choir. SM: What is the relationship between your many orchestras? - I give one third of my time to ancient music, one third of my time to romantic music on period instruments, and one third to modern orchestras. My groups are like a poupée russe, you know those Russian dolls that fit one inside the other. My core baroque instruments group for Bach and German repertoire is Collegium Vocale. For bigger works and French baroque we enlarge it to make La Chapelle Royale. For even bigger classical and romantic works we add about 20 per cent more players to form the Orchestre des Champs-Elysées. This way I can cover a large repertoire while maintaining the organic integrity of the groups as much as possible. SM: Tell me about your newest group, the Orchestre des Champs-Elysées? - The Orchestre des Champs-Elysées was formed in 1991 to perform nineteenth-century masses, oratorios and symphonic works. We are a very young ensemble, and due to budget constraints we meet only six times per year for 2-3 weeks of practice and performance. The OCE has a stable core of musicians, which is very important to continuity and quality. Our musicians must be hard-working and versatile because they play on different members of each instrumental family for Brahms, Beethoven, Mendelssohn and Berlioz - back then instruments changed about every thirty years. Many of our players are professionally interested in organologie. They collect and some even build their own instruments. Marcel Ponseele, in my opinion the best baroque oboist in the world, also plays classical and modern oboe. Of course not every musician can do that, and I am considering establishing specialized sub-groups within the OCE for each style and period. Another characteristic of our musicians is an interest in the history and culture of every musical period. We play early music together before we play Mozart or Beethoven. Modern orchestras are often technically brilliant and emotionally powerful, but they may lack general culture, especially concerning early music. How can you play Beethoven without knowing Bach, Handel and Haydn? As I say, to know Venezuela, it helps to know Spain. The benefit of our authentic approach to the Romantic repertoire is obvious on our new Schumann recording. Listen to the balance between the strings and the winds, for example. Because authentic instruments produce fewer decibels, the winds can blow fortissimo as Schumann indicated without covering the strings, something impossible with a modern symphony orchestra. SM: What is your recording routine? -Ideally we study and rehearse for five days, then we give a six-concert tour in Europe. Then we take a break and the next year study and tour it again. Finally we give two concerts in the same hall, usually in Montreux, which are recorded. That is how we prepared all our big oratorios, the Missa Solemnis, Mendelssohn's Elijah and L'Enfance du Christ. In November 1997 we'll be recording Schumann's Faust Scenes and for the first time we will have to use two different halls, which is a bit worrisome. Normally all the recording would be at the Concertgebouw, but they can't give us enough time, so we'll do the main recording in an Amsterdam studio and then the two Concertgebouw concerts will serve as a reserve. SM: Do you ever feel you have exhausted the recordable repertoire? -Not at all. With Collegium Vocale I record 2 or 3 albums of Bach cantatas each year, and there are many more to do. With the Orchestre des Champs-Elysées, the Chapelle Royale and Collegium Vocale we'll continue to record Brahms, Schumann and Beethoven. We are also re-recording Bach's B Minor Mass, and next summer we'll redo the St. Matthew Passion. I think my early recordings twenty years ago were fervent in a way that is hard to recapture when you are older and wiser, but today singers are far better prepared for period performance, and musicological advances have made us think differently about the masterpieces. Mahler: Lieder eines fahrenden Gesellen & Das Lied von der Erde. Opening their North American tour in the Metropolitan Museum's Grace Rainey Rogers Auditorium, Flemish early music maestro Philippe Herreweghe led the fourteen-member St. Luke's Chamber Ensemble in Schoenberg's bare-bones string orchestra arrangement of Mahler's two great song cycles. Maestro Herreweghe's authentic instrument interpretations of Bach, Brahms, and most recently, Schumann are not very different from Schoenberg's pared-down treatment of Mahler, so Herreweghe was in his element conducting these hauntingly beautiful scores. Schoenberg's reduction clears away much orchestral underbrush to reveal the sturdy trunk and limbs of these austere impressionistic masterpieces. The real wonder is that a handful of string and wind instruments fortified by harmonium, piano, celeste and gong, conjure as much Mahler magic as they do. By reducing secondary symphonic colors to primary ones the noble, timeless narrative is thrown into high relief. The result is sometimes ravishingly subtle, frequently impetuous, but always impressive. The reduced orchestra also means that the vocal lines are completely exposed. Having suffered through too many Das Lieds in which the orchestra drowned out the soloists (I remember how the Met Orchestra at Carnegie Hall swamped Ben Heppner's not inconsiderable instrument), I was thrilled to hear the words again. Tenor Thomas Young displayed a rich dark sound and masterful interpretation. German contralto Annette Markert is a true lieder singer. Her medium-sized, polished voice brought memorable vulnerability to her characterizations. Baritone William Sharp sang the four Lieder eines fahrenden Gesellen with good German diction in a dramatic manner that somewhat compensated for a rather average voice. This concert proved that Schoenberg's minimal Mahler well deserves to become a staple of the chamber ensemble repertory, as long as the soloists are of the highest quality. -Philip Anson. The Metropolitan Museum's concert and lecture series continues through to May 23, 1998. Highlights include pianists Ruth Laredo, André Watts, Ken Noda, Peter Serkin, Alfred Brendel (lectures only), András Schiff and André Previn, violinist Young Uck Kim, the Beaux Arts Trio, Philharmonia Virtuosi, Pomerium, Quartetto Gelato, Dawn Upshaw and the Aulos Ensemble, Chanticleer, Anonymous Four, Wolfgang Holzmair and Bo Skovhus. Tel: (212) 650-3949. Fax: (212) 650-2253.